After testing countless electronic alarm clocks we have come up with a list of the best ones. Read full review now! Travelwey Home LED is a very simple but effective electronic alarm clock. The display is large and the numbers are easy to read even if you have bad eyesight. The brightness of the display can be adjusted. The loudness of alarm can be adjusted and at maximum level it is very loud and earsplitting, so this alarm clock should be able to wake up pretty much anyone. On lower loudness it isn’t obnoxious so if you don’t need loud sound to be woken up you won’t be annoyed every morning. It has 2 speakers on either side. The snooze button is on the top of this electronic alarm clock and is very convenient to reach. After hitting the snooze button you get 9 minutes of peace until the alarm comes back and brings you back to reality. Snooze button also serves as a light that can be used as night light or for other purposes, it’s pretty bright but won’t illuminate the entire room. The button layout is very simple and intuitive. Setting is quick and simple. It only scrolls forward but it zips through very fast, unlike with other clocks when it takes what feels like forever. 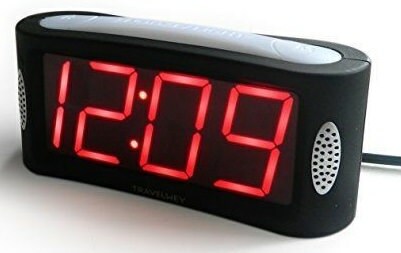 Travelwey Home LED electronic alarm clock is made from plastic that has cheap but durable feel to it. The clock is intended to be powered by US 120V outlet, but you can also put in two AAA batteries as a back up energy source. During battery back up the screen goes blank but alarm and time settings are retained and the alarm will still go off. Overall Travelwey Home LED clock is simple, convenient and well working electronic alarm clock. On top of that it’s inexpensive making it an amazing value for money. That’s why we consider this to be the best electronic alarm clock of 2019! American Lifetime electronic alarm clock is a bit more expensive but it has lots of functionality. It’s perfect for elderly or people with dementia, alzheimer’s or memory loss. The design is elegant and the clock can be set on a surface or hung on the wall. It automatically dims between 7PM and 7AM so it doesn’t interrupt with the quality of your sleep but it’s readable whether dimmer or not. The clock is super easy and fast to set up. 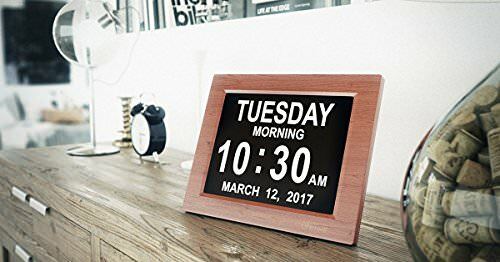 The clock has 8″ high resolution non-glare display and clearly displays the day, date, time and whether it’s “morning”, “afternoon” or “evening”. The information can be shown in either white or yellow color and is easily readable even with very bad eyesight without being harsh on your eyes. The clock features 5 multi-function alarms, you can set reminders to take your medication throughout the day. The alarm sound quality and loudness is good. There are 4 alarm modes – Once, Every day, Weekdays only/Weekends only, Off. American Lifetime electronic alarm clock is cord powered but it has battery backup that will retain the correct time and date during power outage. The cord is quite long which is convenient. TooTa Digital Clock has a really beautiful design. 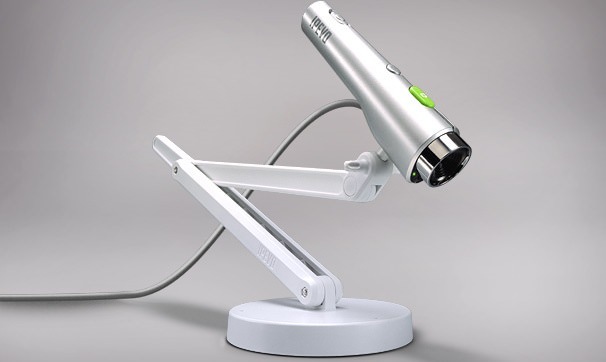 It fits well in any room but is also good size for travel. The sound quality is really good but might be louder. Display is nice and readable. You can set up two or three alarms, there is a weekday mode that will wake you up only on work days (Monday to Friday). There are 3 brightness levels as well an option to turn off the LED light so it doesn’t interrupt your sleep. 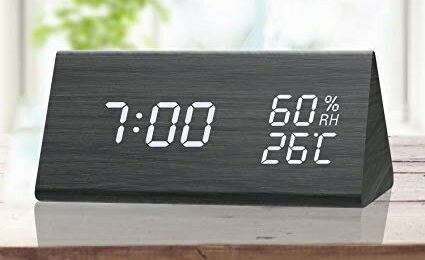 TooTa electronic alarm clock has temperature and humidity sensors and it shows the temperature and humidity on the screen. TooTa electronic alarm clock is USB powered but you can put 4*AAA batteries in it as a back up energy source.